It's official, it's spring. Though you would definitely not know it given the fact that we are getting a nor'easter today in NYC! The temperature outside is certainly not warm enough for springtime clothing but that doesn't stop me from getting the itch to change things up a bit. One way to get a new look without sacrificing warmth is to shake up your layering combinations. In this way you can create fresh color combinations and interesting texture mixes while finding some new looks already hanging in your closet. Layering also enables you to bring out some of those warm weather pieces early in a still seasonally appropriate way. I've put together some inspiration and combination tips to get you started. I challenge you to take another look at your closet with fresh eyes, at least until we actually get into Spring! Top ripped denim and a white shirt with a light-colored yet warm sweater. Get double-duty from your warm weather tanks by pairing a simple white tee shirt underneath. Break out the summery floral dress and still stay warm by combining it with a black turtleneck. 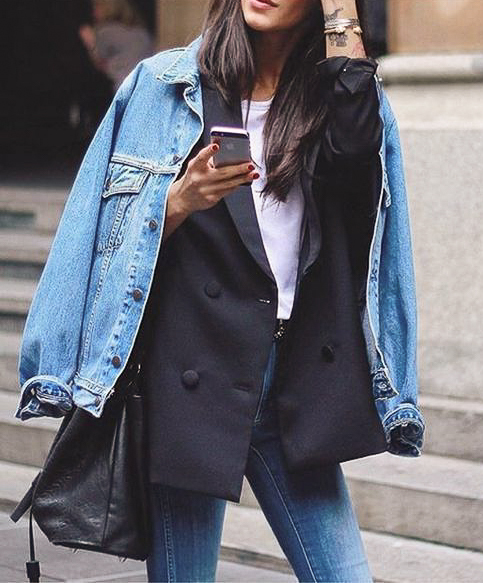 Get a perfect mix of business and casual by pairing a jean jacket with a tailored blazer. Keep legs warm on cool days by tossing jeans under a light dress.